The flowers at your wedding lend an air of elegance and serenity to your reception. 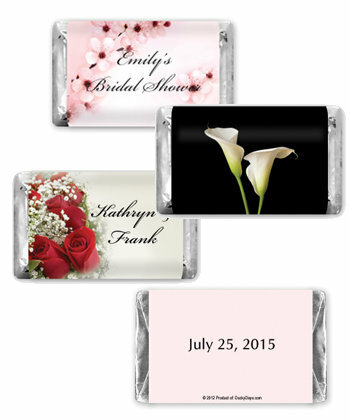 Help reinforce that wonderful feeling with our flower themed Hershey miniature chocolate wedding favors. Classic treats that everyone enjoys, you can personalize them with your names and wedding date and make them your own unique wedding favors. The silver foil on the ends of the Milk Chocolate, Krackel®, and Mr. Goodbar® and the gold foil ends on the Special Dark®, are wonderful accents to the 14 flower designs available. Your guests will love the flower themed Hershey miniature chocolate wedding favors and probably won't be able to wait to get home before they enjoy their fantastic flavors. Your service was the best. The chocolate was wonderful. The Rose Theme was perfect for our day. My wedding was planned in 22 days because my husband is very very ill and you and your products made life a little little less hectic. Thank You so much for your GREAT service and I havetold all my friends.